All the action from the first round of menswear shows as they happen. To the Crypt at St Paul’s Cathedral – which, when filled with a few hundred fashion bods, isn’t as cold as you might think. Here Hackett opened with typical looks for the perfect English gent: grey three-piece suits with pocket squares, silk scarves and bowler for accessories. 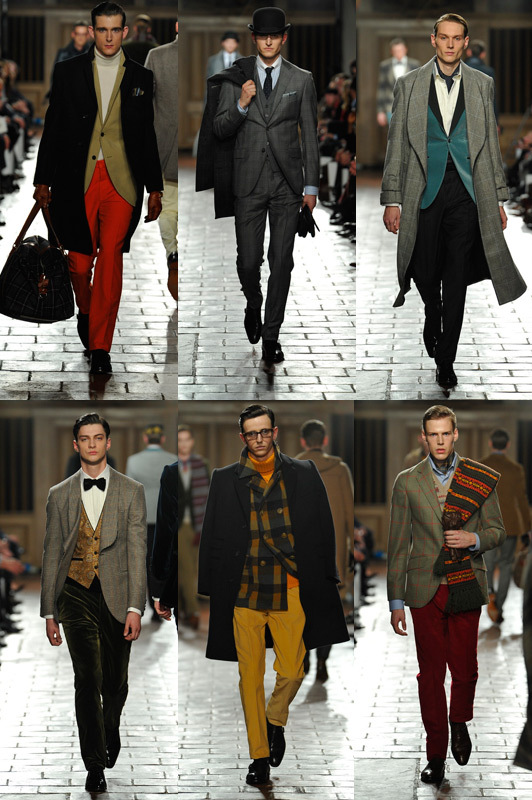 This then evolved into a still formal but delightful array of dressing solutions for men: delicious colour combinations of burnt orange and mustard with navy; moss green with claret, in the way of thick, shawl-collared cardigans with chunky, stripy scarves tucked in to ward off the chill. We’re not sure many will go for the tartan ponch, but the baby blue rollneck paired with a textured charcoal suit was a nice touch. “Affordable luxury for the modern man” is how David Bradshaw classifies his new label, Hunter Gather. But his ‘modern man’ is one interested in projecting that he is part of an extended work of art. The whole project (Hunter Gather is a self-styled “posse” of architects, photographers and writers as well as the design team) is very consciously ‘artistic’ – I almost caused a revolt attempting to sit in a chair. Said chair was part of ‘it’ and not just a normal chair; luckily, this push towards the extraordinary serves the clothes well. While many are recognisable staples, zips have become a statement and pocket handkerchiefs a new addition to the power dressing arsenal. At Hentsch Man it was the models, not the clothes that made an initial impact. Quirky and diverse, the select trio (ticking all the ‘quirky’ boxes with piercings, tattooed eyelids and facial hair) made an immediate statement. The choco-mallow brew we were then handed was as a PR masterstroke: juggling the steaming cups, the brandishing of iPhones had to wait as we were forced to digest the self-consciously individual personality of this label. The models seamlessly embodied the edited collection we then shuffled through to view: understated, cool, with the urban softened by knits and prints. Perhaps the most prominent emerging trend from day one of London Collections: Men is simplicity, and this season Shoreditch boutique Mr Start was bang on trend. The front rowers were immaculately suited and booted – none of that novelty ‘rif-raff’ here – and the models were very much a reflection of this. Lee Roach isn’t known for his flamboyant style and this season’s showing was no different. Minimalism doesn’t quite stretch as far as Roach’s paired back aesthetic. Structured lapel-less jackets varied in length, paired with seemingly uniform tailored trousers in either black, navy or white. Seamless wool blazers gradually turned into ‘single-puff’ puffa jackets, still with tailored trousers and Chelsea boots. After a hatless morning, this blog’s favourite favourite subject – David Gandy, of course – suddenly slipped on a fedora for the Lou Dalton show. Indoor hat-wearing? What’s all that about? Plus we hear from our Fulham spy that Gandy wears a flatcap inside his local pub too. At the Topman Design show (where that hat was still firmly on) we asked if the pub tip was on the money. “Absolutely,” he said: “and I’ve got a cap for tonight. It’s because I’ve got outrageously uncontrollable hair and now that people recognise me when I go out, if I can’t be bothered to do it [tame his hair] it’s cap on or hat on, a big chunky knit, and I’m good to go.” So there you are. Luke Leitch, deputy fashion editor. For AW13 Topman Designs took us on an adventure; a sartorial expedition if you will, which began with cropped jackets and out sized parkas in putty and sand, paired with loose cargo pants tucked into hiking boots. We then romped through to boiled roll-neck knits in spicy orange and fuschia and belted intarsia cardigans accessorised with shrunken beanies, hip-flasks and leather i-pad holders – the definitive kit for an urban explorer. This classic look was modernised by way of spangly lurex knits and metallic accents on upscaled backpacks and boots. ALL HAIL THE NEW MANKLE? Spencer Hart has unfortunately had to cancel their upcoming London Collections: Men show, which was scheduled to take place on today at 5.30pm. Production problems have meant that the Savile Row tailoring house doesn’t have a full collection of samples to present to the press, so the show, sadly, cannot go ahead. The suave label stole the show at last June’s London Collections with a catwalk show featuring a whisky-swigging, cigar-smoking Benedict Cumberbatch swathed in a cashmere dressing gown, much to the delight of ‘Cumberbitches’ worldwide. Man model of the moment David Gandy will host a private screening of our favourite fashion farce Zoolander during London Collections: Men. We know what you’re thinking: err, why? Well, it’s all to do with the brand new partnership between Red Nose Day and the world of fashion, both of which Gandy is a staunch supporter. Before the screening – which, before you get too excited, is by invitation only – he’ll host an intimate reception for press to highlight Red Nose Day and the fashion world’s collaborative plans. Next articleHot Shots: How Beautiful is Miss East Africa 2012? Very! !